Various new approaches help define vertebral compression fracture so can be earlier diagnosed. 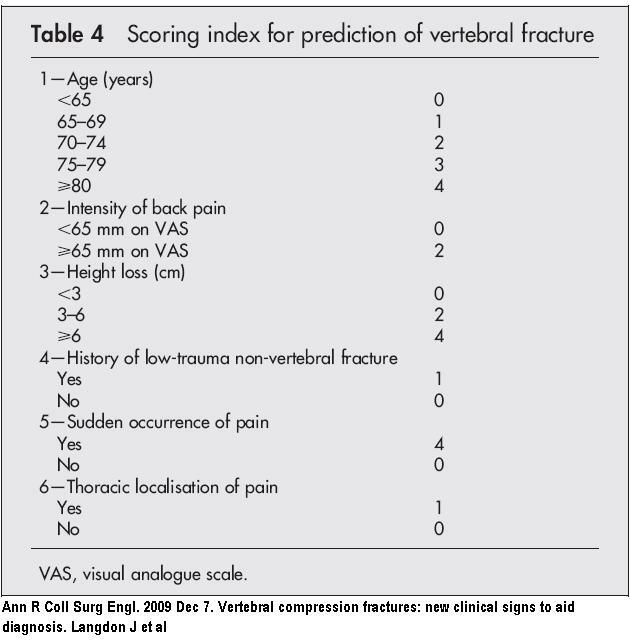 Vertebral compression fractures: new clinical signs to aid diagnosis. Ann Rheum Dis. 2007 Jan;66(1):81-5. A clinical tool to determine the necessity of spine radiography in postmenopausal women with osteoporosis presenting with back pain. If score is 7 or more, the changes of having xray evidence of a compression fracture was 43%. Spine (Phila Pa 1976). 2001 Jul 15;26(14):1606-12. Back problems among postmenopausal women taking estrogen replacement therapy: the study of osteoporotic fractures. Rheumatology (Oxford). 2010 Mar;49(3):505-12. Epub 2009 Dec 16. Lateral back pain identifies prevalent vertebral fractures in post-menopausal women: cross-sectional analysis of a primary care-based cohort. Clark EM, Hutchinson AP, McCloskey EV, Stone MD, Martin JC, Bhalla AK, Tobias JH. Presence of lateral waist back pain associated with a 4.5 fold risk of vertebral fracture.